Abhaya the little jumbo was lucky but what about others? Last week, the Dehiwala Zoo welcomed a new baby elephant “Abhaya” who had lost his family to a tragic train/elephant collision. It was just another peaceful night in October last year for two elephant families roaming the jungles of Habarana. There were two baby elephants aged only a few months in their midst and grazing peacefully, they approached the railroad. It was only when the sound of the oncoming train disturbed the silence of the night that the mothers recognizing the danger tried to protect them but the collision was deadly. The mother jumbos were instantly killed and the two calves injured. Wildlife officers reached the accident site at Kithulothuwa along the Kantale Trincomalee railroad at dawn and the baby jumbos were sent to the Girithale wildlife facility for treatment. The one that had all its legs broken didn’t survive long but, the other, believed to be only eight months fought hard for his life. His leg was fractured in two places. Later transferred to the Pinnawela Elephant Orphanage, the elephant treated by the Pinnawela veterinary surgeons along with vets of the Peradeniya University’s Veterinary Faculty made friends with all. Seeing this friendly baby elephant at Pinnawela, the Director of the Zoological Gardens Bashwara Gunaratne thought the zoo would be a better place it. “The baby is friendly with humans; its leg is a little shorter after the accident, so it can’t be released back to the wild. It also loves to have closer interaction with visitors,” said Mr. Gunaratne. The baby jumbo moved to the zoo on Saturday, April 23. Brought to Dehiwala in the morning in a large truck, it was kept in a nearby temple until the auspicious time. Around 3 p.m, the jumbo was brought to its new home with villagers and other curious onlookers accompanying it and given a special hut near the Elephant Arena-I. Those who visited the zoo on Saturday were asked to suggest names and some 450 names were reviewed by an astrologer. Considering that the elephant had got a new life thanks to the dedicated efforts of the veterinarians, the name Abhaya was selected said Education Officer of the Zoo, Nihal Senarath. Animal rights activists believe Pinnawela would be a better place for the little elephant where it would be able to blend with other elephants and have a little social life. Sathwa Mitra’s Sagarika Rajakarunanayake pointed out that the interactions with the visitors should not be a harassment to the baby elephant. Many zoo visitors do not act responsibly feeding the animals and even throwing things at them despite warnings to refrain from such acts. 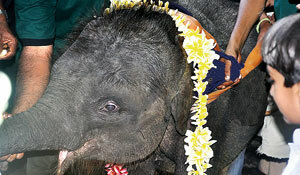 But the Zoo officials said the baby will always be accompanied by a mahout who will safeguard it from undue attention. Abhaya’s accident is not an isolated one. Since 1992, 75 elephants have died due to train accidents according to Department of Wildlife Conservation (DWC) records. Many have also been injured in similar accidents in the Mahaweli wildlife region and the North Western wildlife regions. 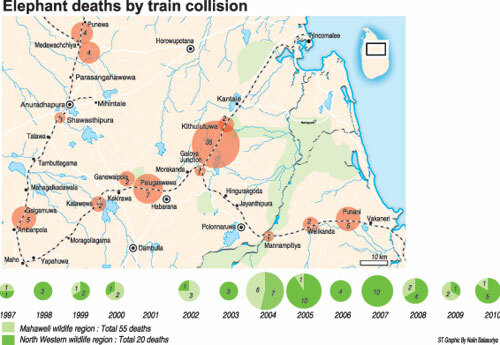 Accidents occur along a few key stretches in Polonnaruwa and Habarana. Most notable are the Habarana-Galoya, Galoya-Kantale, and Galoya-Minneriya routes. This area is elephant country with many parks famous for elephants such as Minneriya, Kaudulla, and Flood Plains. Elephant experts also say these accidents are seasonal, the majority occurring during the dry season (May-September) and the northeast monsoon (November-January) when the elephants move between habitats in search of food. But the reasons for the collision are different from one rail stretch to another. Director General of the Department of Wildlife Conservation Dr. Chandrawansa Pathiraja said most of the accidents tend to occur at bends. Many of these areas are thickly forested and so neither the train driver nor elephant could see the approaching danger at a distance. Since 2005, speed limits have been imposed for the most vulnerable stretches. Dr. Pathiraja said his department is analyzing the elephant/train collision data to take action to minimize the accidents such as clearing a few metres of forests along the track so that drivers can spot elephants in a distance and vice versa. Dr. W.A. Dharmakeerthi, veterinarian of the Mahaweli wildlife region who had to treat and do post-mortems on many of elephants victimes pointed out that accidents at one stretch near Minneriya are caused by a steep slope where the railroad had been laid by cutting a mound. So the elephants can’t get away, even when they see the approaching train. “You can reduce the steepness of these slopes, so that elephants can quickly climb them and escape,” Dr. Dharmakeerthi suggested. Elephant experts also link the accidents to herd behaviour. “Herds or females hesitate to retreat when there are calves or juveniles hanging around the railway. Young animals get confused and may stay on the railway itself if the associating herd is scattered at both sides of the tracks,” said Dr. Deepani Jayantha, country representative of Born Free Foundation, who has analyzed the elephant collision data and its patterns. The Born Free Foundation has had discussions with the DWC about finding solutions for this issue. Gunshot injuries are still the main reason for elephant deaths in Sri Lanka that average 200 annually. But the elephant/train collisions continue and need to be addressed to prevent more little jumbos ending up orphaned like Abhaya. It was another dark night and the bus bound from Colombo to Galgamuwa was speeding to its destination. All of a sudden the driver had seen what looked like a moving rock on the road but it was too late. The bus crashed into the elephant. The elephant survived, but the conductor travelling on the foot board of the bus died. “The Thekka Kele in between Galgamuwa and Ambanpola is an elephant crossing where drivers should be careful,” warns Dr. Chandana Jayasinghe who had treated the injured elephant. He recalled that a few months later a van too had collided with an elephant, which angered by the collision attacked the vehicle killing a passenger. In another roadside accident in Medawachchiya, an elephant calf had been killed instantly by a careless tipper. The accident occurred around 1 a.m.. An elephant calf was a victim of another roadside accident at Habarana last year. The roads in some of these areas have been recently carpeted, an invitation for some drivers to speed. So it is important to demarcate the areas of elephant crossings and impose speed limits. Ultimately, whatever the regulations are – it is the driver’s responsibility. Mayday! Colombo, we may have a problem!